Barbecuing with charcoal is easy with Weber’s lighting aids. 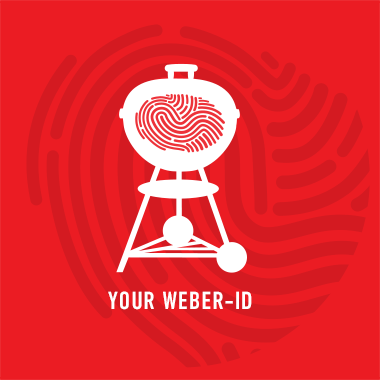 Weber also offers various charcoal products. The rule of thumb is that charcoal heats up faster but briquettes stay hot for longer. Either way, you should always use specialist products, such as Weber’s lighter cubes, to light your barbecue. This is the safest and easiest way to achieve red-hot coals. Measure out the amount of charcoal specified in the recipe using the briquette scoop (which was included free with your Weber charcoal barbecue) and pour into the Chimney Starter. Shake the glowing coals into the grilling baskets (beware of sparks!) That’s it! Plug the barbecue into a socket, turn the controller to ‘high’ and just let it heat up for 25 minutes with the lid on. You’re ready to start grilling. It won’t be long before the barbecue is at the perfect temperature for cooking. Our tip: Always use a barbecue thermometer to measure the core temperature of the food and ensure its cooked to your liking.